The challenge for this garden was the side entrance to the house. We needed to make it clear which way to go and make the journey to the front door interesting and welcoming. This meant there had to be something happening in the garden year round. Foliage plays a big role in this garden! The pathways were designed to provide a gracious entrance and be wide enough in some spaces to allow for neighbors to gather outside the home office balcony. The backyard needed to accommodate the trampoline, food gardening, outdoor dining and entertaining. Who knew a trampoline could function as a room divider?! The raised beds are at a comfortable height and depth for easy tending and keeping pets out. The result is the whole family can share the yard yet every function has a zone of it's own. And, you always know what season it is! 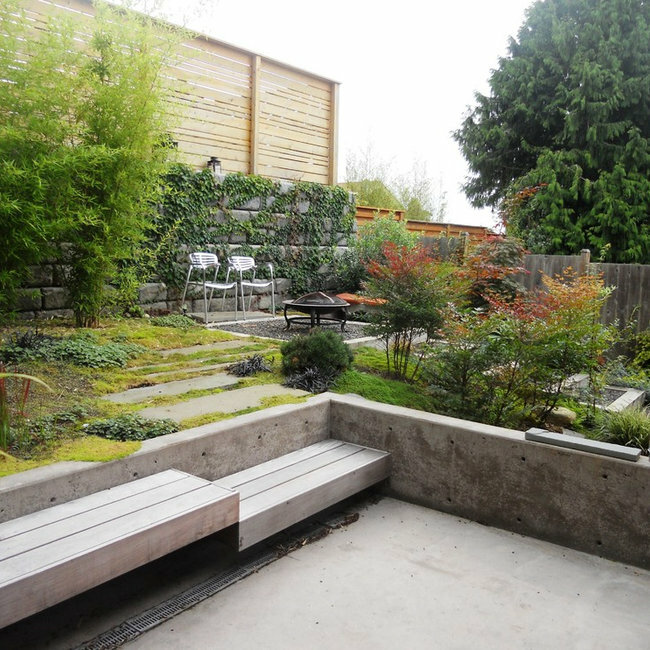 This backyard started out with an awkward slope that made using it difficult for this active family. Improvements needed to accommodate room for a slip-n-slide and ball play; eventually screen out unwanted views and invite the whole family into the yard with beautiful gardens and gathering spaces. 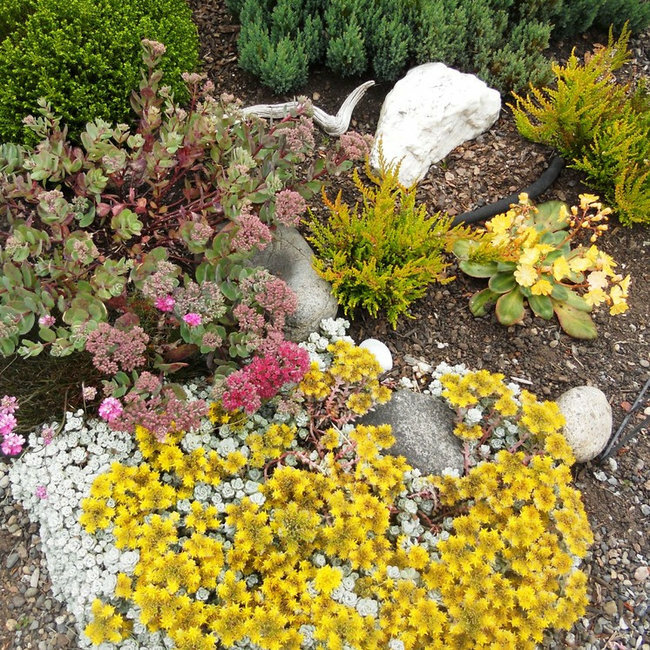 This front yard garden is meant to pay tribute to the heather meadows you might encounter on a mountain hike, but punch it up a notch with vibrant color combinations and textures. This is a sampling of some of the plant borders and containers I've created for clients over the past few years. These pictures feature some of my favorite go-to plants that perform beautifully but aren't 'divas' who require all kinds of special care. This garden surrounds a corner unit condominium. The owner wanted a contemporary feel but with a touch of romance and vibrant colors. 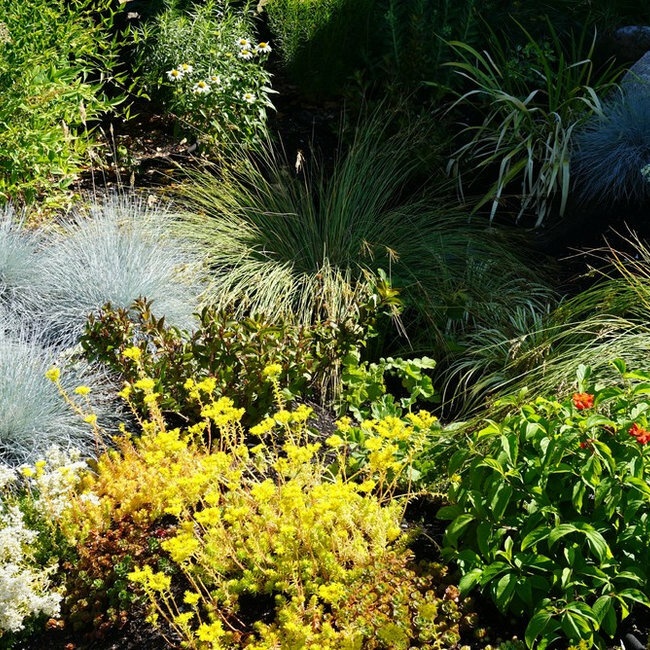 The result is a combination of ornamental grasses and evergreen plants with exuberant perennials and flowering shrubs. 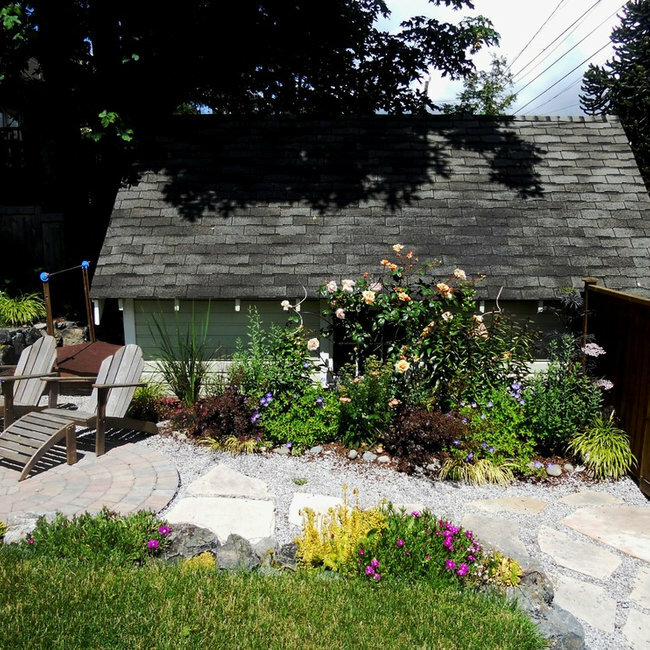 The house has great style and is well loved but the backyard didn't have the personality to match. Add some gorgeous pots, a beautiful curving dry stack wall for informal seating, raised beds for vegetables (even a bench for reflecting on those beautiful tomatoes), and plants chosen for year round interest, color and movement and you have a perfectly crafted backyard retreat. Raised beds, deck railing and dry stack wall installation by Altered Earth LLC. This garden has two personalities. 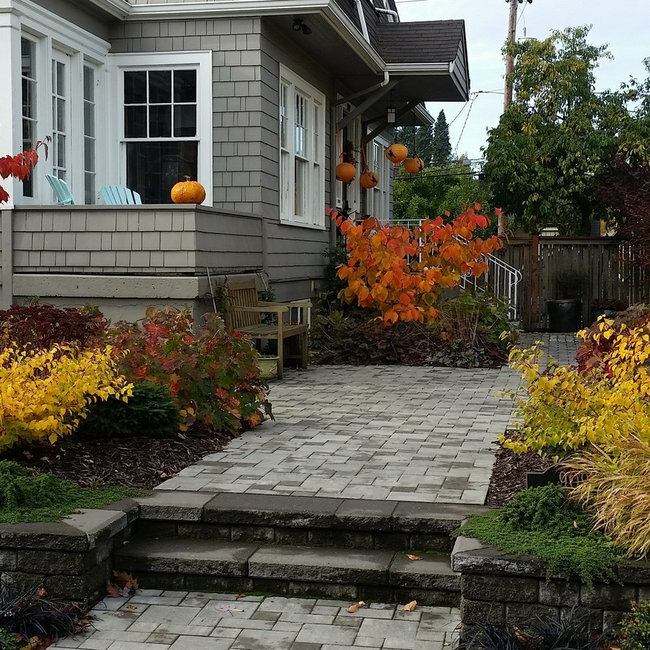 The front yard is full of exuberant color and meant to pay tribute to a childhood beach home. The backyard is meant to be more contemplative and provide abundant choices for seating and entertaining. Even the small vegetable garden in the back of the yard has a bench! 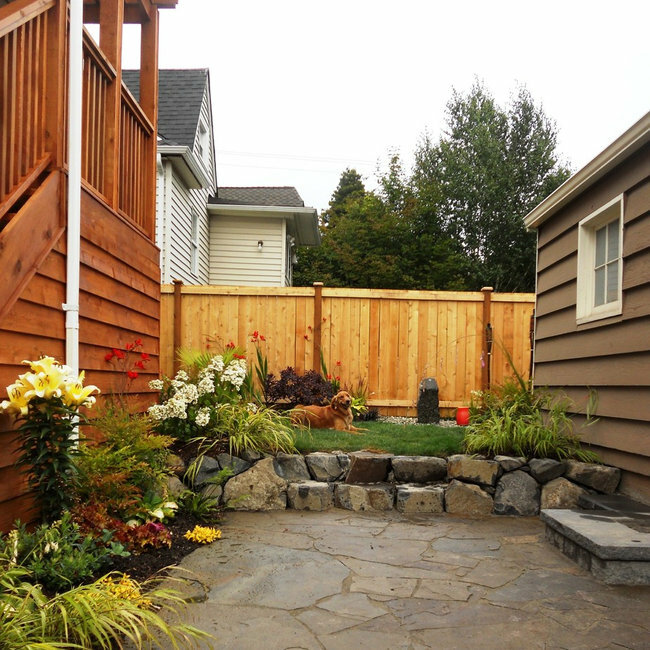 Two personalities divide the backyard too as one side is dedicated to lush plantings and the other to easy access and work zones for composting and vegetable gardening. The metal arbors and paver pathways unify the garden and make for a peaceful, welcoming garden. Hardscaping installed by Altered Earth LLC. Even though this homeowner rents his home he has no intention of leaving any time soon because of the good vibes of the space and the neighborhood. A couple of new patios, fire pit, a collection of new containers and a couple of cool shade sails made the garden a place full of great energy for outdoor living. Portability was kept in mind just in case the family does move one day. Meanwhile, everyone is enjoying the color and welcoming spaces to hang out. 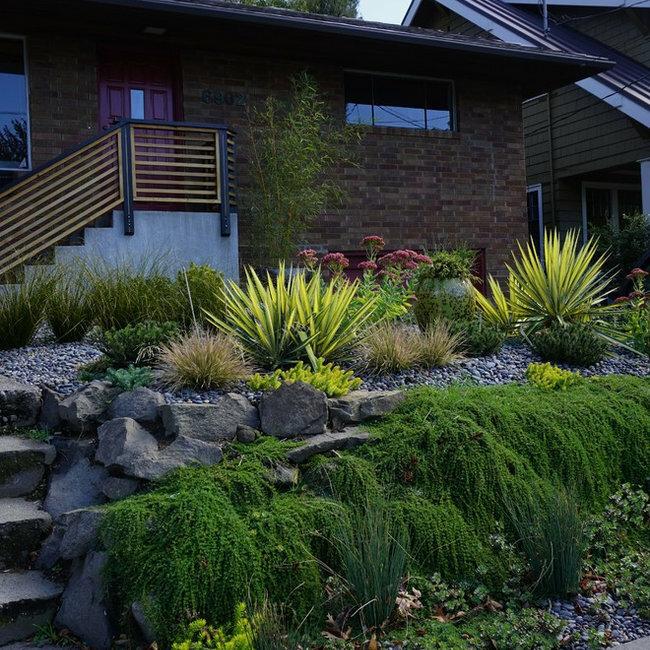 This high impact but low maintenance garden was designed to honor the home's architecture and the busy homeowner's lifestyle. While there are not a lot of flowers in the garden there is no shortage of color. 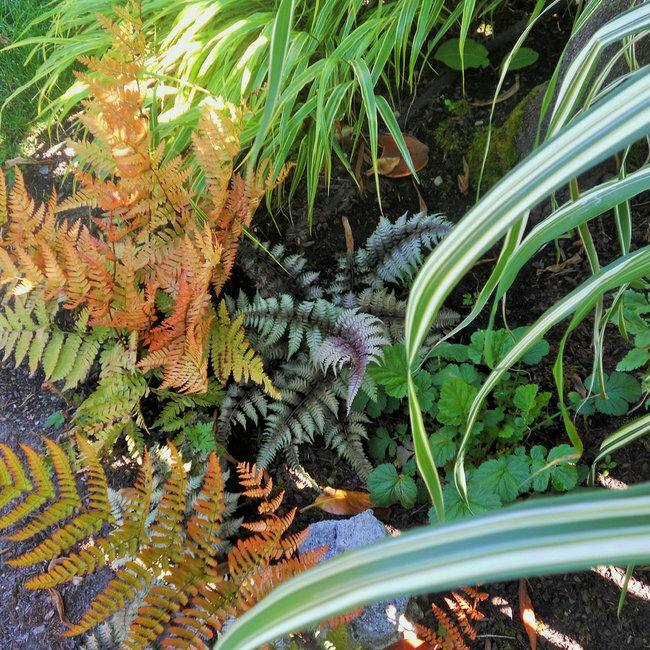 A dynamic mix of evergreen and deciduous plants means there is always something happening in this small garden. 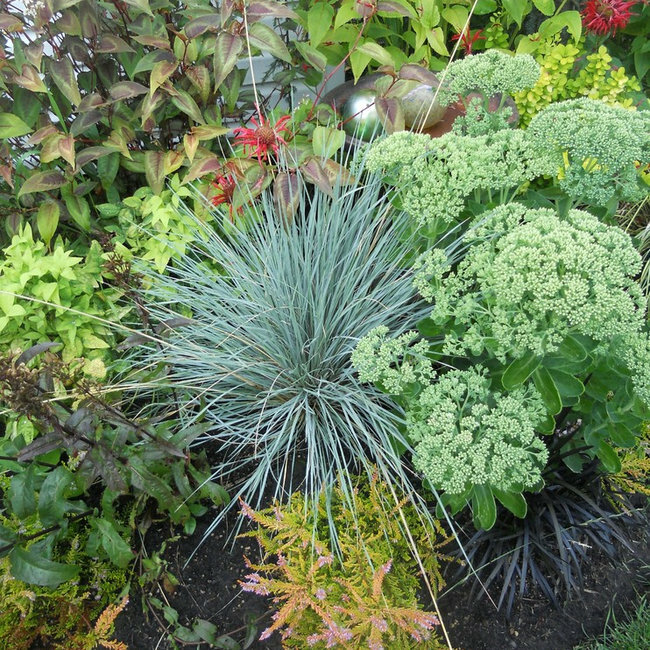 Every plant had to earn it's spot with beautiful foliage, interesting texture or eye catching movement. And, the beach pebble mulch is so pretty when wet that the homeowner actually looks forward to rainy days now. 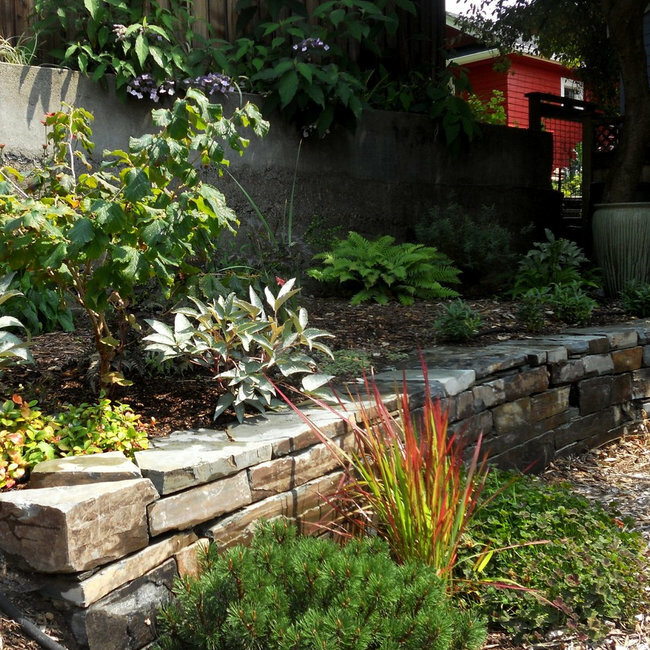 This garden came about under distress when a neighbor's renovation left the homeowners feeling on one hand dwarfed by a new monstrous retaining wall and over exposed on the other hand due to the size of the neighbor's new home. 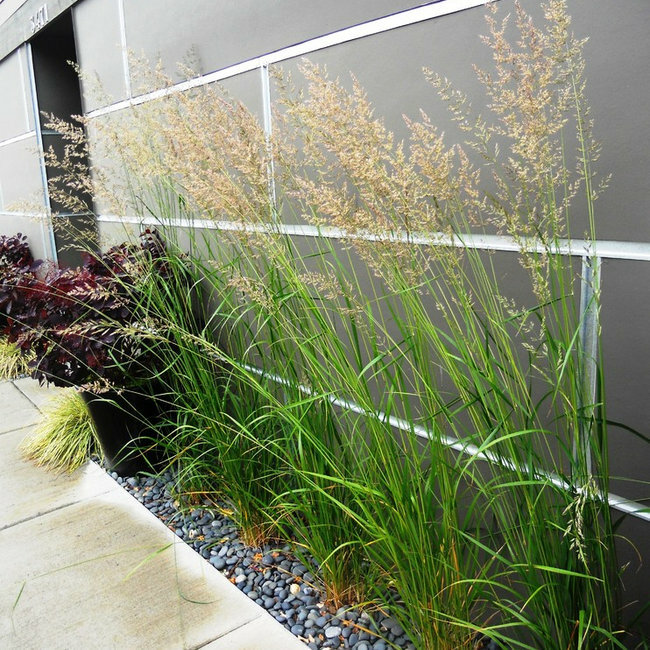 Thus began a true collaboration between designer and homeowners with the goal of restoring the peace and privacy that the homeowners craved in their garden. 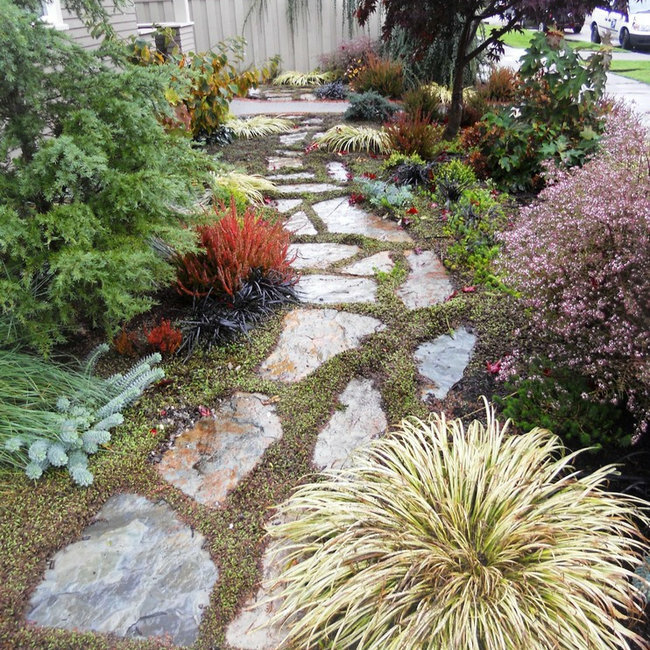 The resulting garden reflects the design savvy of the homeowners when combined with just the right horticultural and hardscape elements. Now the view is close up and personal and even that monstrous wall covered with vines helps to make the place feel like a sanctuary. A small garden with dreams of travel to exotic locations. This young family needed a place for stay-cations where everyone including the dog had space to play and relax. The only plants requested by the homeowner were palm trees and then just lots of color. The palms set the tone for bringing in plants that thrive in the Pacific Northwest but still have a tropical feel. Hot plants combine with a water feature, the cool tones of basalt and blue stone for a retreat where everyone feels at home.